The Tamiya TL01 Aluminum Universal Swing Shaft Set (38mm) With Shims 1 Pair Set Blue has an average rating of stars based on 27 customer reviews. 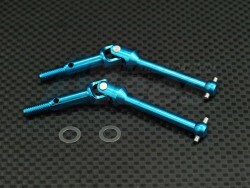 Fits and works very well but is very weak/soft and bends easily, so only for experienced racers that do not crash often. These are brittle they lasted 10 minutes before breaking with a standard 540 brushed motor so I would not recommend at all.